Because the Somos part of the settlement was annexed to the village it has 650 inhabitans at present.It is located at the only ferry between the northern and southern shore transporting motor vehicles, too. That is why it is called the northern gate of Somogy county. Its history is closely connected with the history of the ferry. The village is mentioned in the document of foundation of the Benedictine Abbey of Tihany (1055). The first mole and port of the ferry were built in 1802. The first motor steamship was in service from 1928, it has transported also lorries and buses from 1958. The other touristic site of the village is Szántódpuszta which is a protected group of buildings with a chapel of the 19th century, a mansion, a village inn, servants' quarters and farm-buildings. 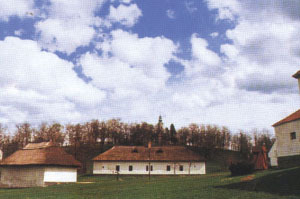 King András I endowed the Benedictine Abbey of Tihany with this lowland plain ('puszta') that remained in its property till the middle of the 20th century. The modern farm and the group of buildings are from the Reform Age. Since the middle of the 1970s it has become a touristic centre with exhibitions, hotels, restaurants and a riding-school. The old-time life in the puszta, culture of servants, history of Tihany ferry and the works of Ádám Pálóczi Horváth poet, lessee of the puszta between 1787 and 1790 are introduced in the exhibitions taking place in the servants' quarters. Exhibitions of fine arts in the hall of the mansion while means of viniculture of Kő hill in the cellar. In 1995 Europa Nostra prize was given to Szántódpuszta. 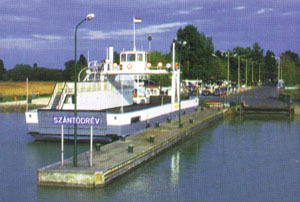 Ferry inn at the junction of the road to the Szántód ferry, with a memorial tablet of Mihály Csokonai Vitéz on its wall. At the entrance of the village the statue of St. Christopher carrying the child Jesus on his back made by László Botfai Hűvös in 1939; St. Christopher is the patron saint of travellers. Szántódpuszta is the site of meetings of international fame. Two-in-hand tournaments, international dog expo in summer. Jakab-day feast and fair at the week-end including July 25th. Red route sign leads from the railway station of Szántód-Kőröshegy to the neighbouring village of Balatonendréd where famous products of the great folk art of the village, the bone-lace making can be studied in the lace house. Green route sign takes us from the ferry via the former boggy area filled by today, to Szántódpuszta.